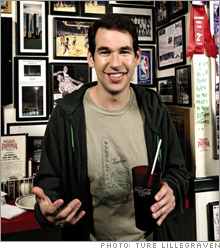 An interview with Doug Ellin, 38, television writer. (Fortune Magazine) -- Now that he's shown America what Hollywood is really like, "Entourage" creator Doug Ellin is setting his satirical sights on hedge funds. In October, HBO said it is developing Ellin's newest series, which he describes as a "mature 'Entourage' set on Wall Street." Since most hedge fund traders' talk is saltier than the expletive-spewing agent Ari Gold's, the character at the heart of "Entourage," and they look nothing like its dreamy superstar, Vincent Chase, Fortune's Stephanie Mehta asked Ellin about how he plans to make his new protagonists likable and glamorous. What made you want to do a show about the world of finance? "There are average Joes walking down the street making more money than Alex Rodriguez, and that's an interesting thing." But most shows about Wall Street have failed miserably: 'Bull,' 'The $treet.' How do you avoid their fate? "What I hope to do, as I did with 'Entourage,' is make Wall Street a backdrop for interesting characters. A lot of Hollywood shows before ours failed. We're making it about guys and friendship. And we're taking a different approach to Wall Street that won't be so technical but will still, hopefully, immerse you in a world and let you see what that world is all about." Most hedge fund managers aren't particularly sympathetic types. "I'm dealing with [that issue] right now. As long as people see a realistic view of something, that's your way in. Obviously the movie 'Wall Street' did it well; it found, in a morality play, a way to make characters interesting. What I hope to do with this show is to find a similar way in by using comedy. Usually, when people are funny, you start to like them even if they're doing crazy things." Viewers understand what an actor does for a living. But Amaranth? That's a mystery to most people. Are you going to get into the details of the business? "Everybody knows what an actor does, but [before 'Entourage'] no one really knew what an agent did besides talk about his clients. We got into the battles, we went behind the scenes in a light, comedic, layman's way that people could understand without our talking down to them. [On the new show] we're not going to spend a lot of time going into the dealmaking. It's more about the lifestyle outside the office and opportunities afforded them from making that kind of money." Will there be an Ari Gold-like thorn in the protagonists' side? Like, say, an Eliot Spitzer-inspired character? "It's too early to say, but I think most of those [hedge fund] guys have a thorn in their side, whether rightfully or wrongfully, so we'll probably show that. At the end of the day, I want it to be a wish-fulfillment show, while being realistic."